With so many different kids bikes on the market, it can be confusing to figure out which ones are best. You want a bicycle for your child (or grandchild) that will be easy to learn to pedal on, durable enough to be handed down, and lightweight enough to make biking fun. The bad news is that there are a lot of awful, heavy bikes out there; the good news is that there are more and more child-specific bike companies coming on the market producing some seriously awesome bikes. I’ve compiled a list of the best bikes for your 3 to 5-year-old (i.e. 12 inch and 14 inch bicycles). Many of these bikes we have tested and reviewed; some of them we haven’t but they are so universally known as a great purchase, I’ve included them as well. We’ve also created a guide to help you know WHY these bikes are the best bikes and what to look for to make sure you are picking the best bike for YOUR individual child. If you are short on time, scroll straight down to our top picks. Note: These bikes are best for 3-year-olds, with the intent that they will be able to ride them for a few years. If your child is closer to 5 than to 3, you might also want to check out our list of the best 16″ bikes. Learn more about picking the right size bicycle for your child below. More of an audio learner than a reader? This video sums up the info in the post below. More of a visual learner? 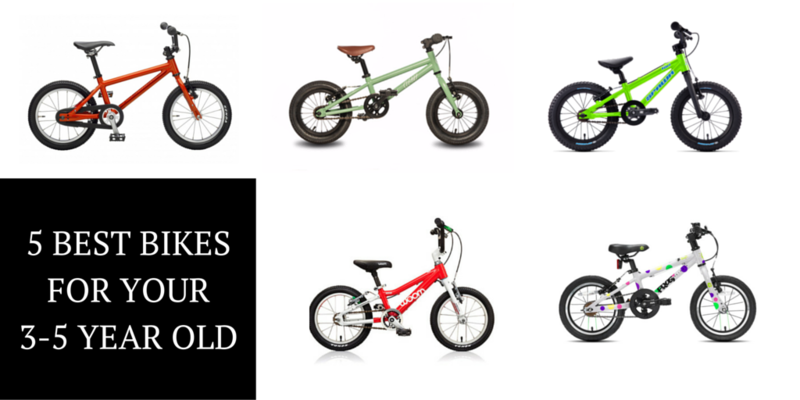 Keep on reading…..
We’re about to give you a list of all the good bikes on the market, but how do you know which one is best for your child? Consider these factors, and then use the comparison chart at the end of this article to help you choose. Each child is different. For instance, my son and his cousin who are only a few months apart are nearly six inches apart in height. Therefore, it is really very important to measure your child before buying a bike. What may fit one child at 3 years old may not fit another until 4. For details on how to measure your child and pick the right size bike, read our Kids Bike Size Guide. For maximum comfort and stability, I recommend that your child’s inseam be at least as long as the minimum seat height. While technically their inseam can be slightly shorter than the minimum seat height (it will fit on their tippy-toes), kids this young who are just learning to ride do best if they can put their feet flat on the ground. After ensuring a bike is the right size, the next most important thing to consider is the weight. When comparing two bikes, I will *almost* always pick the lightest one. It makes a huge difference in a child’s enjoyment level and in how long they can ride. Look for a bike that is no more than 30% of your child’s body weight (tough isn’t it)? Of all the bikes on my list, the Woom 2 is the lightest. It’s also my son’s favorite—I don’t think that’s a coincidence. The plus of the 12-inch bikes on this list (the Cleary Gecko and the Specialized Hotrock) is that they fit really young riders (as young as 2.5 years old). 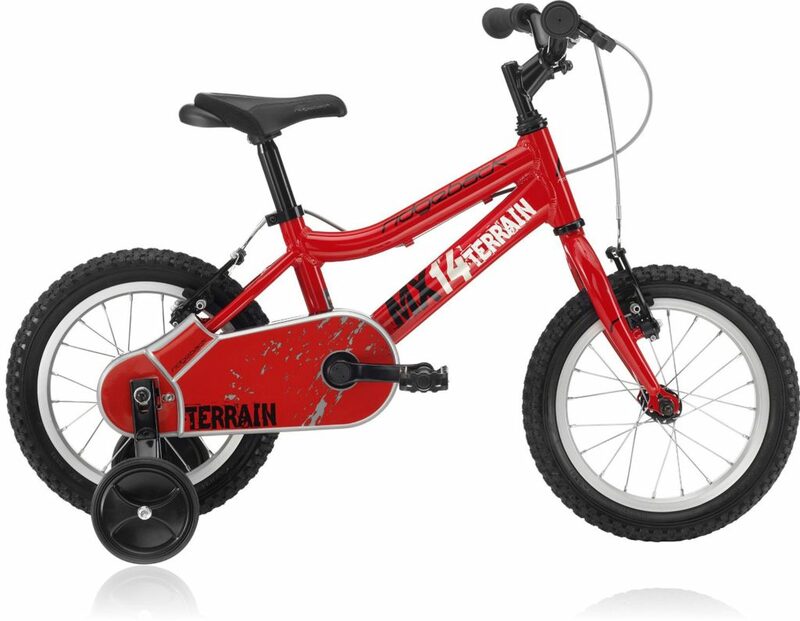 If your child has been on a balance bike since a super early age and is ready to graduate to a pedal bike earlier than most, go for a 12 inch bike for sure. On the other hand, if your kiddo is 3.5+, I would recommend choosing a bike with 14 inch wheels instead. Why? The larger wheel size makes it significantly easier to roll over obstacles—cracks in the sidewalk, rocks and bumps at the bike park, etc. I’ve seen firsthand my son do much better on a 14 inch bike compared to a 12 inch bike. To understand kids bike sizing and wheel size a little better, read our post on kids bike sizes. Unfortunately, just like most things in life, the more you spend on a bike the better quality it is going to be. Buy a cheaper bike from a big box store and it will be heavy and fall apart quickly. The good news is that when you buy a high-quality bike, like any of those on our Top 5 list, it will last thru several children. This makes it a good investment if you have younger kids it can be passed on to or to sell on Craiglist. I’m a huge proponent of teaching children to use hand brakes and bypassing coaster brakes. I’m at a point now where I won’t even put my son on a bike with a coaster brake, or teach another child to ride using one. To decide whether a freewheel or coaster brake set-up is best for you, and more about both options, read our article on coaster brakes vs. handbrakes. A child’s bike outfitted with a coaster brake only. Training wheels? Just don’t do it! If your child hasn’t mastered a balance bike yet, start there and then transition to a pedal bike later. If you MUST have training wheels, I’ve listed those bikes that offer them in the table below, but you’ll notice most of the best kids bikes don’t even offer them anymore. This is a highly personal choice—some people have a clear preference for aluminum or steel. I don’t personally. Aluminum is the lighter material, and we all know how important saving weight is on kids bikes, but steel is super durable (and classic). Finally, the part you’ve been waiting for! Here are our five top picks. 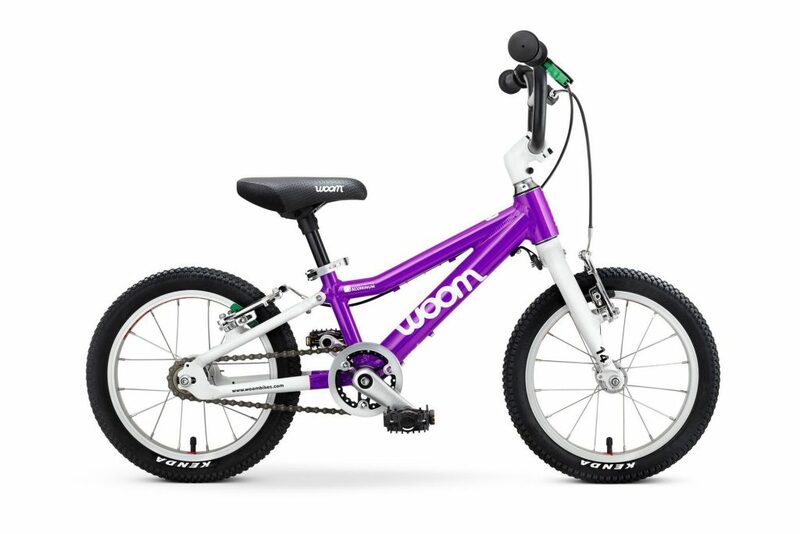 The Woom 2 is without a doubt my son’s favorite bike, and we aren’t afraid to call it THE BEST 14 inch kids bike on the market. While the price tag is a bit higher than many of the other bikes on this list, the quality of the bike is worth every penny. No detail has been overlooked—from the color-coded brake levers to the upright geometry and featherlight weight, the Woom 2 is perfection. Our kiddo also prefers the 14 inch wheels of the Woom 2 (compared to a bike with 12 inch wheels) as they allow him to roll over bigger obstacles. To learn more, read my full review of the Woom 2. Oh, how I love this little bike. 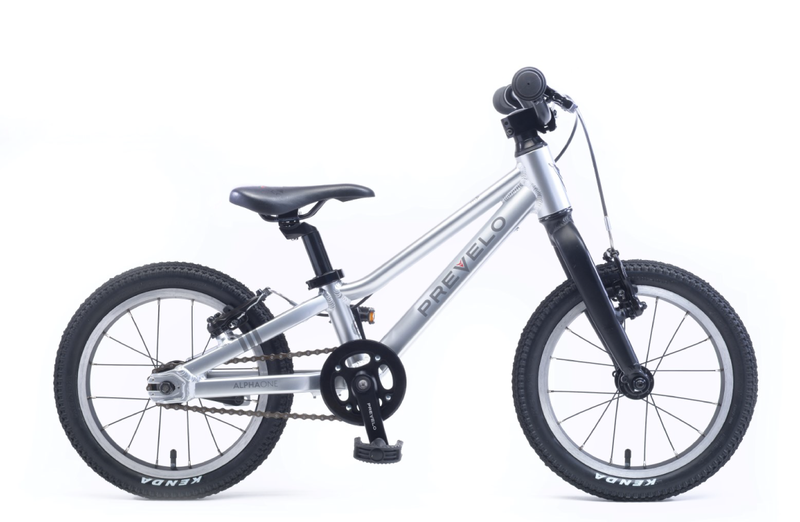 Its small frame makes it the perfect first pedal bike for early balance bike graduates, and the easy-to-pull Tektro brake levers make learning to operate handbrakes possible even for the youngest riders. 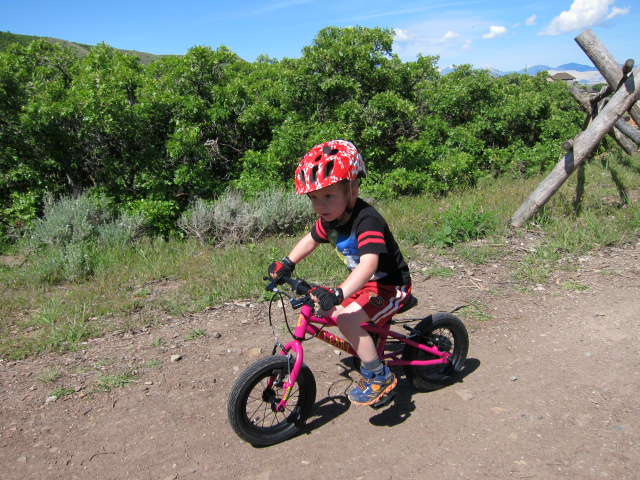 My little guy loves this bike for riding singletrack, and the beefy Kenda tires make it possible. To learn more, read my full review of the Cleary Gecko. The Prevelo Alpha One is a newcomer to this list, but it deserves its spot on the top 5. This 14″ beauty rides well and looks good. It can be fitted with an optional–and highly recommended–freewheel kit. The rest of the bike is built up with high-quality components including Kenda tires and easy-to-operate Tektro v-brakes. If you are a mountain biking family (like we are! ), the Spawn Yoji should definitely be on your shortlist. It’s a bit pricey (like all good mountain bikes are), but the high-quality components and low weight make it worth the price. The Yoji has real off-road tires, Tektro brakes, and is built up to weight a mere 13 pounds. 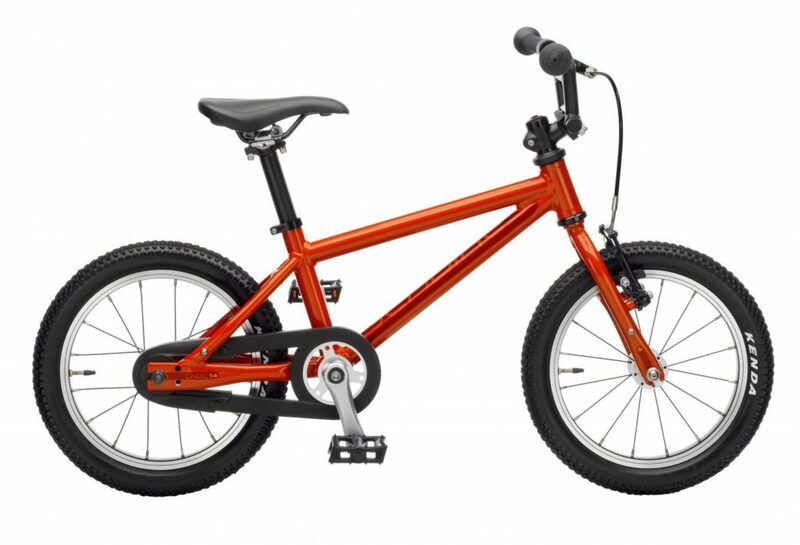 This 14″ beauty is one of my son’s favorites due to the beefy mountain bike style tires. The paint job is gorgeous and the components are top notch: Cane Creek headseat, Kenda tires, aluminum Ahead stem. The Pello Romper has recently been upgraded so that it had dual front and rear handbrakes, which we love. Read my full review of the Pello Romper. While these bikes aren’t in my Top 5, they are good quality bikes that deserve a look. Frog bikes are now available in the U.S.! 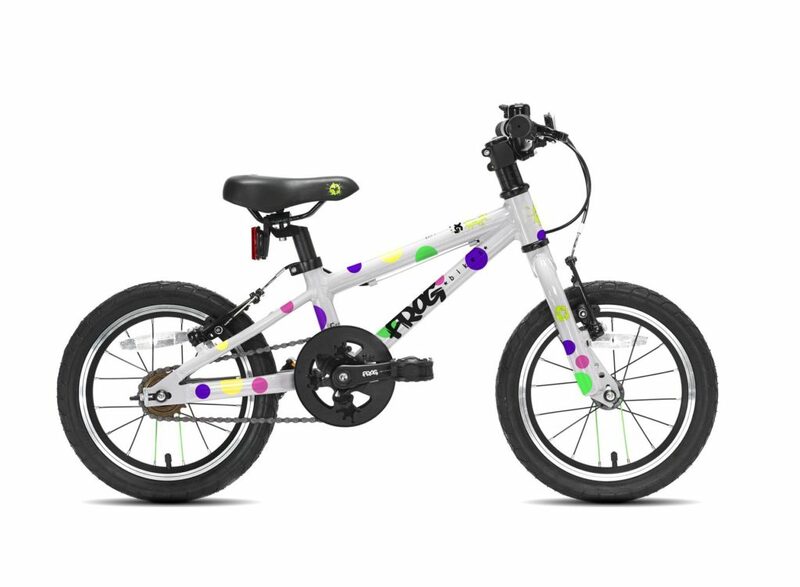 The Frog bikes are absolutely adorable, come in fun colors, and are easy to learn to ride. They also come with two sets of Kenda tires: one for road and one for dirt. 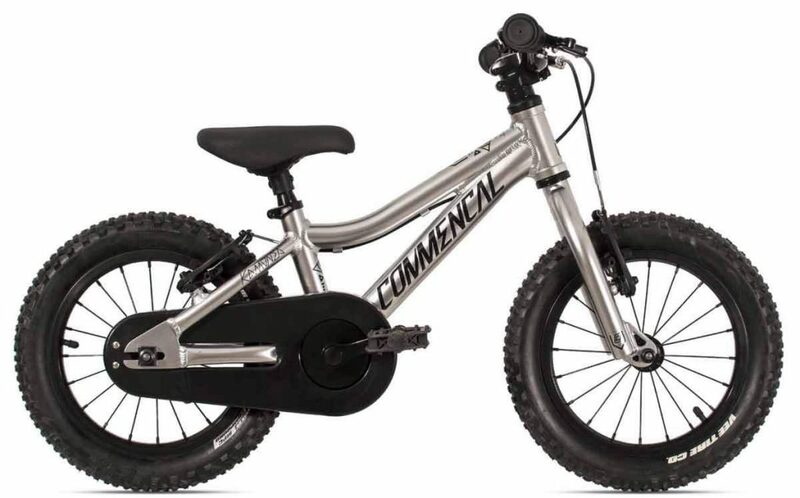 Unlike many of the big bike manufacturers, Commencal is killing it with their kids bikes. Known for their adult mountain bikes, the brand has created a 14″ bike that looks cool enough to hang with the grown-ups. Luckily, it doesn’t just look good, it rides well also. The Commencal Ramones 14 offers dual Tektro handbrakes and no coaster, a comfortable saddle, and Vee tires. Best of all, it’s far more affordable than most of the bikes out there with a freewheel. For more information, read our detailed review of the Commencal Ramones 14. As of fall 2018, Islabikes has discontinued sales in the U.S. If you are lucky enough to live in a market where they are still sold or if you can find one used, the Islabikes Cnoc is a top pick. This 14” bike is a cult favorite among parents in the know, and if you are looking for a bike with good resale value, this bike is it. The bike is lightweight, fast, and durable. 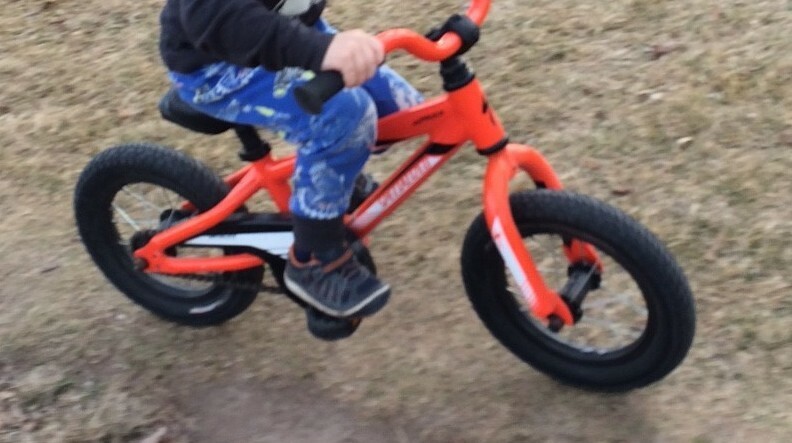 Read my full review of the Islabikes Cnoc 14. No longer for sale in the U.S. You might be able to find one used. Most of the bikes on this list are only sold online and aren’t available at your local bike shop. 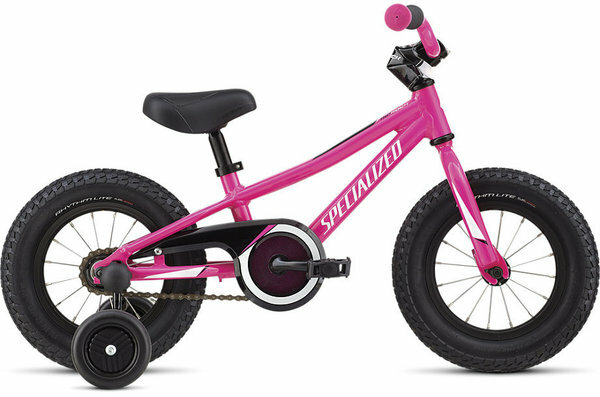 Specialized, on the other hand, sells only thru local bike shops which means this is an easy bike to find locally and your child can try it on for size prior to purchasing. While this is a solid first bike (literally, it’s super durable), it is not quite as nice as some of the other bikes on this list. It also comes with training wheels, so we recommend taking those off. Learn more by reading my full review of the Specialized Riprock 12. 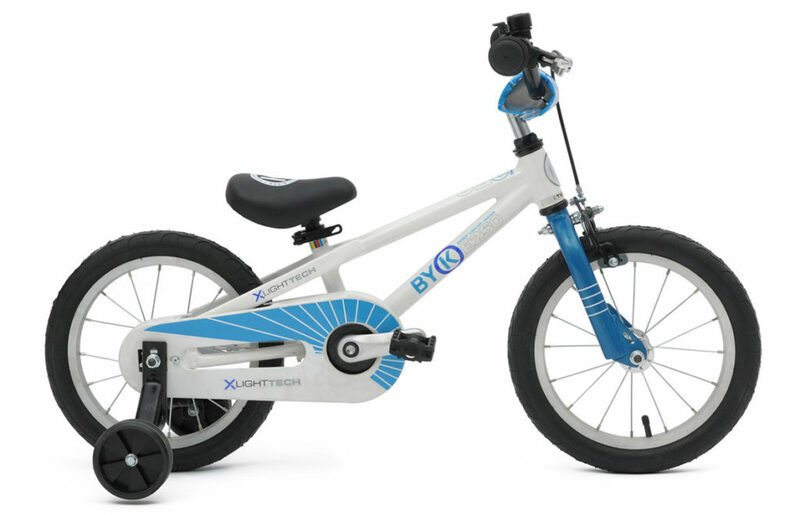 While this company is popular in their home country of Australia, it’s not as common to see a Byk in the U.S. Child appropriate geometry and 14” wheels for rolling over obstacles make the Byk E-250 a decent choice. That said, the lack of a freewheel option and the hard-to-pull brake levers puts this bike lower on my list of faves. 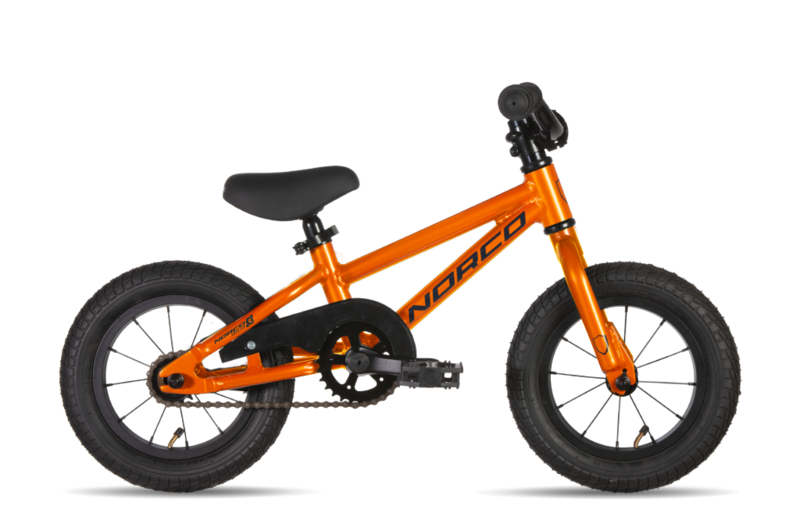 Norco makes rad adult mountain bikes, and the Norco Coaster 12 looks like a mini version. While we like the quality and durability of the bike, we don’t love the coaster brake or the heavier weight (when compared to the bikes on our top 5 list). This rad-looking little bike is made by Ridgeback, a UK bicycle company. Decent components and a freewheel make this bike a viable choice, although the weight (17 lbs) would give me pause. 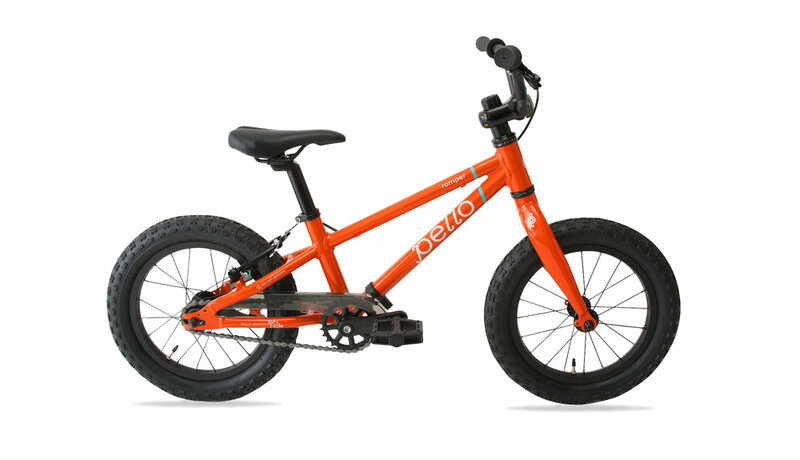 For the price, you can find a much lighter bike for your little one. Not sure which of these bikes is best for YOUR child? Here’s how they stack up. We’ve also linked to our detailed reviews where we have one. Still need help making your decision? Here are a couple articles to help. Also, sign up below to receive your free, printable bike buying cheat sheet to help you when shopping. For under $100, your best bet is to look for used bikes on Craigslist/Facebook marketplace, etc. You might also be able to find a local shop, o second-hand sports store, or second-hand kids gear store that sells used bikes. You should be able to find a pretty nice bike for under $100 by looking used. I’m looking at the Norco 14” bikes, but can’t find ANY reviews for them. We mostly ride the pump track or dirt trails, so I like the MTB features of it. Do you know anything about it? 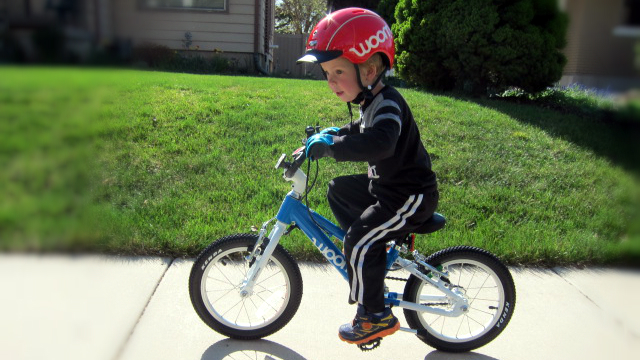 Hi Brynn, I haven’t personally tested the Norco 14″ but I know a lot of parents like it, especially the fact that it can be purchased at a local bike shop. I would definitely go for the freewheel, not coaster, version. My other concern would be the weight. Norco doesn’t list it, and some of their other kids bikes are pretty heavy. I would ask the bike shop to put it on a scale and weigh it for you before buying…..If you end up getting it and like it, let us know. Sounds like its one we might need to do a review on! I found your article very insightful, but I am having trouble understanding how 30+ years ago kids were able to learn to ride bikes on heavier clunkier and cheaper versions. I understand these bikes may make it easier for the kids, but they will still learn on “cheaper” bikes. So what is the point in buying an expensive bike if the goal can be accomplished by buying something more economical? I am not the sort of person who resist change or is scared of change. I just don’t think a 4 year old needs $200+ bike to learn how to ride. I was one of those kids! Kids can learn to ride (and have fun) on any bike–heavy, clunky, whatever. The difference is that on modern lightweight bikes with kid appropriate geometry kids are able to do a few things they generally weren’t able to on those bikes 30 years ago: (1) learn to ride a pedal bike at 2 or 3 years old with no training wheels, (2) learn to ride a pedal bike with no training wheels in a single day, (3) ride long distances easily. Yes, kids can have fun on any bike. But there is no doubt a lightweight, well-designed, high-quality bike makes a huge difference in how young and how easily kids are able to learn to ride. And then how fast and far they are able to ride once they’re pedaling…. My son is turning 3 years old and has done amazing on his push bike! We are so excited to get him his first big boy bike. I really appreciate your website it has been a great resource. I am glad we found it! I too feel that getting a good quality bike that is lighter in weight is worth the money. I see how well my son does on single track trails and the distance he rides on his push bike… this tells me that paying $300 dollars is worth every penny for a family that rides a lot, but I do understand it to be a lot for a family that doesn’t ride often together! Well said “another” Amanda. 🙂 Hope your son loves his new bike. Just wondering what you think of the strider 14x? 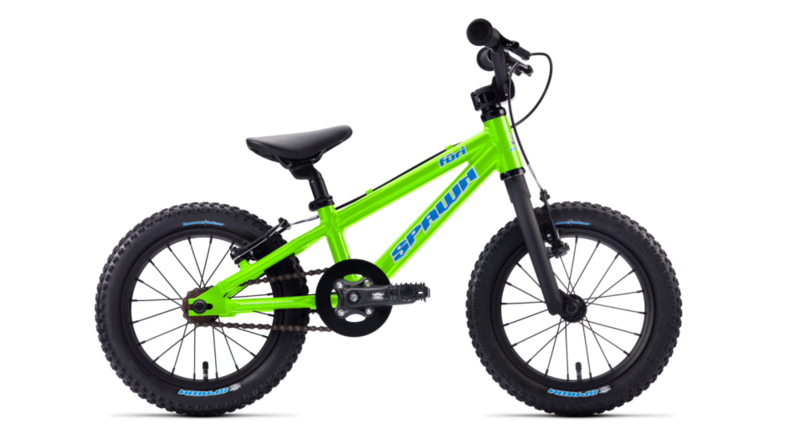 Hi Kim, The Strider 14x is a decent enough bike and makes sense for kids who aren’t quite ready to pedal yet, but are close. That said, I would still prefer one of the bikes on this list and just temporarily remove the pedals. The Strider 14x doesn’t have handbrake which I prefer. My daughter is 3 years old. She never had balance bike and didn’t express much interest in riding push bike a year ago either. Should we get balance bike first, bike with training wheels or regular bike ( i like woom)? I appreciate your advice! I would go with a balance bike. She’s still young enough that she’ll get plenty of use out of it. If she is a really athletic kid that picks things up quickly, you could go with a pedal bike (Woom) right away and just remove the pedals until she gets the hang of balancing. In any case, skip the training wheels. I’m looking for a bike for my son’s fourth birthday in a little over a month. It will be his first bike, so I want to take the pedals off and start off using it as a balance bike. He has short legs and only a 16″ inseam, which eliminates several bikes on this list. I almost eliminated the Woom 2, but then I noticed that on their website the minimum seat height is listed as 15.94″ which should work, I think. Have they changed the specs since this article was written? Do you think this bike would work for him? He’s also not very heavy, only around 33 lbs right now so we need something very light. 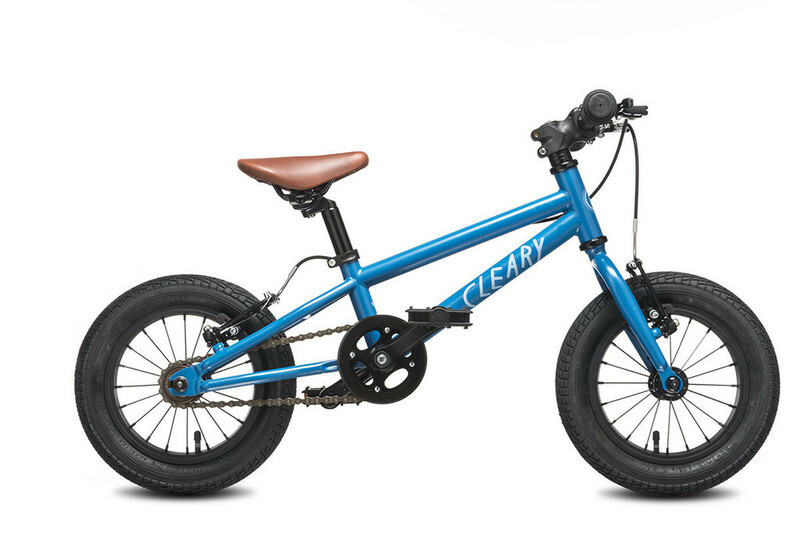 We were also considering the Cleary Gecko, but my husband thinks the low handlebars would be difficult for him as a complete beginner. You’re right, the min seatpost height has changed. I’ll make sure to update it here. I think the Woom 2 would work great for him, especially if he still has another month of growing to do. It’s my favorite bike for kids this age, hands down.